TEN-year-old Owen Jenkins demonstrated maturity beyond his tender age to clinch back-to-back tournaments wins on the Cuestars Under-21 Bronze Tour. Jenkins followed up last month’s success in Salisbury by claiming the winner’s trophy on home tables at Waterlooville Sports Bar. The young talent from Havant fought back from 1-0 down to defeat Tunbridge Wells starlet Dylan Smith 2-1 in the final of the second leg. Jenkins and Smith both progressed through their respective round-robin groups and two knockout rounds without dropping a frame. Eight-year-old Harry Wyatt completed a remarkable weekend by knocking in the day’s highest break of 20 and reaching the semi-finals where he lost 2-0 to Jenkins. On his debut in Salisbury, he failed to win a match. 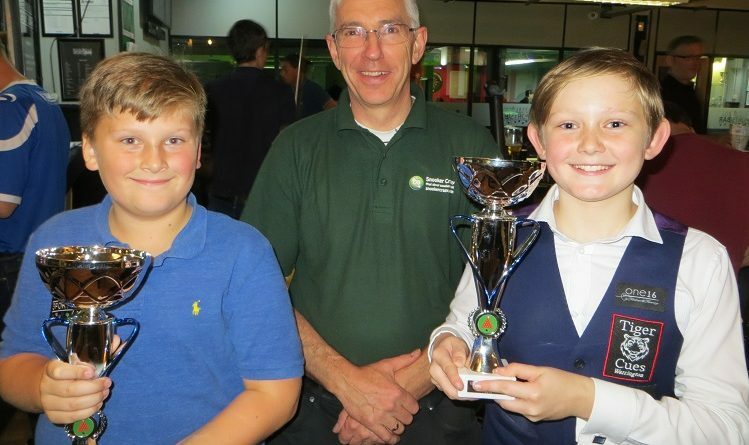 The previous day, he beat his highest break with a 28 and then surpassed that with a 31 in the Under-13 League at Chandlers Ford Snooker Club. Thomas Sharp (Portsmouth) lost 2-0 to Smith in the semi-finals for the second tournament running. Katie Griffin (Swindon), Thomas McEvoy (Warminster), Will Kempson (Salisbury) and newcomer Daniel Walter (Portsmouth) all qualified for the knockout for the first time in the event sponsored by Waterlooville-based website Snooker Crazy. ROUND-ROBIN GROUP A: 1st, Owen Jenkins (Waterlooville Sports Bar); 2nd, Will Kempson (Salisbury SC); 3rd, Freddie Turner (Salisbury SC); 4th, Nathan King (Salisbury SC). ROUND-ROBIN GROUP B: 1st, Dylan Smith (Victoria SC, Tunbridge Wells); 2nd, Harry Wyatt (Chandlers Ford SC); 3rd, Thomas McEvoy (Salisbury SC); 4th, Billy Reid (Waterlooville Sports Bar); 5th, Jaydon Elliott (147 SC, Swindon). ROUND-ROBIN GROUP C: 1st, Thomas Sharp (Waterlooville Sports Bar); 2nd, Katie Griffin (Jesters, Swindon); 3rd, Daniel Walter (Mayfair SC, Gosport); 4th, Taylor Elliott (147 SC, Swindon); 5th, James Slade (Crucible, Newbury). QUARTER-FINALS (12 points): Jenkins 2-0 McEvoy, Wyatt 2-1 Griffin, Smith 2-0 Walter, Sharp 2-0 Kempson. SEMI-FINALS (15 points): Smith 2-0 Sharp, Jenkins 2-0 Wyatt.